Fighting to survive in a world with the darkest power! Okay, I'll stop now. 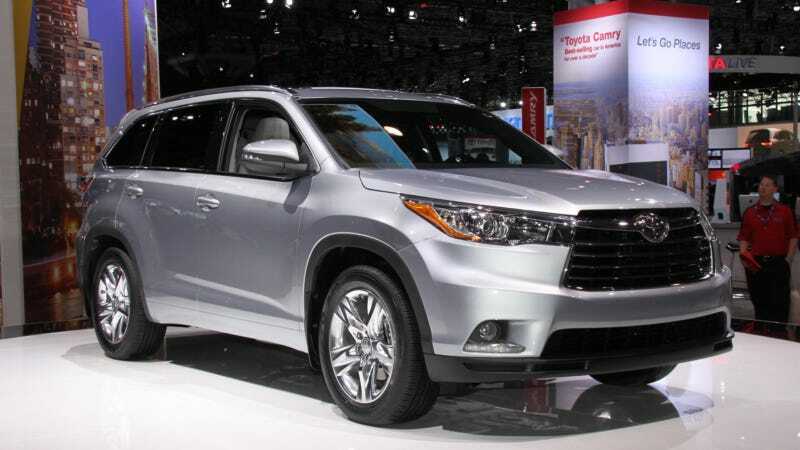 Here it is, the 2014 Toyota Highlander, beefed up in more ways than one. It's bigger, roomier, and has a revised suspension and electric power steering system for what Toyota says will be improved handling and road feel. Available engines include a 2.7-liter four cylinder and a 3.5-liter V6 in regular and hybrid configurations. Expect it to go on sale early next year. And when it debuts, it will do so through an "exciting partnership" with Nickelodeon and noted cartoon sponge SpongeBob Squarepants. Toyota officials didn't go into details on this during their presser, except to say that "This partnership will engage Highlander families in a fun and unique way." I would have thought of SpongeBob as more of a Scion FR-S guy, but I guess I was wrong. We'll have to see how that pans out, but we can expect plenty of kids to get lured into the Highlander this way.